In a world where teenagers are trained for the most horrific three minutes of their lives, Nessa and Anto have both survived their Call, but fate has a cruel way of rewarding them. Nessa is branded a traitor as no one believes that someone like her could survive the experience. She’s thrown in prison and eventually sent where all traitors are sent – back to the horrifying Greylands, but this time there’s no way home. Anto is packed off out of the way to join the militia. Ireland is being invaded and the enemy are building their army from the very people defending it. However, Anto can’t get Nessa off his mind, he knows in his heart that she’s innocent and he’ll go to any length to rescue her. About as far removed from the book in my last review as it’s possible to get! Not pretty, not sweet and endearing, but vicious, fast-paced and compelling. OK, they both have magic and mythology in them (just about everything on this site has) and they are quite inclusive in their own way. 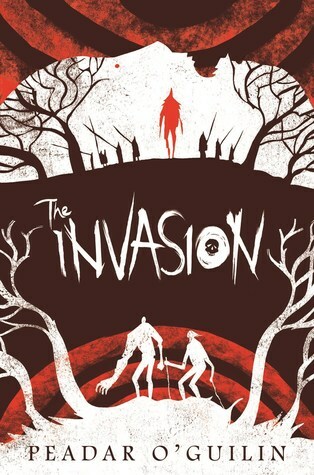 But I certainly couldn’t recommend The Invasion to younger or more sensitive readers. I think the cover makes it fairly clear what this involves – with the cracked stone, fire and a hint of fierce magic. No rainbow glimmer here. It really helps if you read The Call first. It’s not absolutely essential – a smart reader will pick up the story soon enough – but I’d recommend reading them back-to-back. Again it’s graphic novel-like in a good way. Bold, full of incident (not to say violent weirdness) and tonnes of bad stuff happening to people you’ve grown to care about. I guess that last aspect is the reason for the well-meant but less-than-helpful endorsement from Buzzfeed: “it’s PERFECT for Game of Thrones fans”. Nope. It’s better than that. It is not medieval Europe with dragons.There is no gratuitous sexual violence against women or girls. And (spoiler alert) not everyone you like dies. What is has got is camaraderie, courage, loyalty and love. Not to mention loss, greed and distorted humans. If you want full-on Irish mythology with nothing held back, then it’s perfect. US Jacket art by Jeffrey Alan Love. It’s rare I rate a US cover over a UK one – but this is spot on. 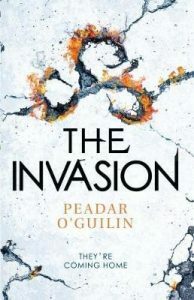 This entry was posted in Review and tagged #writersreviews, Peadar O'Guilin, review, The Call, The Invasion, YA by KMLockwood. Bookmark the permalink.